One of the challenges we all have is being able to be a friend to someone who is sick. All of us at one time or another go through a sense of being unsure of what to say to someone who faces illness. In training others, I often remind people to be a friend, because we often lose sight of the most basic emotion. We are in pain when are friend is sick. We visit to offer support and companionship. And the truth is, that is what being a friend is about. With that, however, there are still things we should all try to avoid saying. And while the following is related to illness, many of these suggestions could be useful methods of communication in other circumstances as well. ‘A closed mouth gathers no feet.” It’s a charming axiom, but silence isn’t always an option when we’re dealing with a friend who’s sick or in despair. The natural human reaction is to feel awkward and upset in the face of illness, but unless we control those feelings and come up with an appropriate response, there’s a good chance that we’ll blurt out some cringe-worthy cliché, craven remark or blunt question that, in retrospect, we’ll regret. Take this real-life exchange. If ever the tone deaf needed a poster child, Fred is their man. “How’d it go?” he asked his friend, Pete, who’d just had cancer surgery. If we’re not unwittingly insulting our sick friends, we’re spouting clichés like “Everything happens for a reason.” Though our intent is to comfort the patient, we also say such things to comfort ourselves and tamp down our own feelings of vulnerability. From now on, rather than sound like a Hallmark card, you might want to heed the following 10 Commandments for Conversing With a Sick Friend. 2. 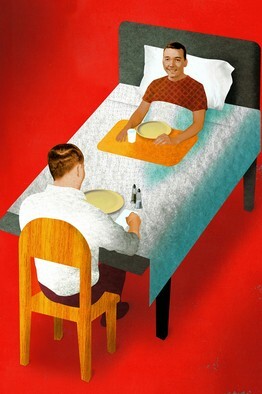 Treat your sick friends as you always did—but never forget their changed circumstance. However contradictory that may sound, I promise you can learn to live within the paradox if you keep your friend’s illness and its constraints in mind but don’t treat them as if their illness is who they are. Speak to them as you always did (tease them, kid around with them, get mad at them) but indulge their occasional blue moods or hissy-fits. Most important, start conversations about other things (sports, politics, food, movies) as soon as possible and you’ll help speed their journey from the morass of illness to the miracle of the ordinary. 5. Get the facts straight before you open your mouth.Did your friend have a heart or liver transplant? Chemo or radiation? Don’t just ask, “How are you?” Ask questions specific to your friend’s health. “How’s your rotator cuff these days?” “Did the blood test show Lyme disease?” “Are your new meds working?” If you need help remembering who has shingles and who has lupus, or the date of a friend’s operation, enter a health note under the person’s name in your contacts list or stick a Post-it by the phone and update the information as needed. 6. Help your sick friend feel useful. Zero in on one of their skills and lead to it. Assuming they’re up to the task, ask a cybersmart patient to set up a Web page for you; ask a bridge or chess maven to give you pointers on the game; ask a retired teacher to guide your teenager through the college application process. In most cases, your request won’t be seen as an imposition but a vote of confidence in your friend’s talent and worth. 7. Don’t infantilize the patient. Never speak to a grown-up the way you’d talk to a child. Objectionable sentences include, “How are we today, dearie?” “That’s a good boy.” “I bet you could swallow this teeny-tiny pill if you really tried.” And the most wince-worthy, “Are we ready to go wee-wee?” Protect your friend’s dignity at all costs. 8. Think twice before giving advice.Don’t forward medical alerts, newspaper clippings or your Aunt Sadie’s cure for gout. Your idea of a health bulletin that’s useful or revelatory may mislead, upset, confuse or agitate your friend. Sick people have doctors to tell them what to do. Your job is simply to be their friend. 9. Let patients who are terminally ill set the conversational agenda.If they’re unaware that they’re dying, don’t be the one to tell them. If they know they’re at the end of life and want to talk about it, don’t contradict or interrupt them; let them vent or weep or curse the Fates. Hand them a tissue and cry with them. If they want to confide their last wish, or trust you with a long-kept secret, thank them for the honor and listen hard. Someday you’ll want to remember every word they say. Though most of us feel dis-eased around disease, colloquial English proffers a sparse vocabulary for the expression of embarrassment, fear, anxiety, grief or sorrow. These 10 commandments should help you relate to your sick friends with greater empathy, warmth and grace. —Ms. Pogrebin is the author of 10 books and a founding editor of Ms. magazine. Her latest book is “How to Be a Friend to a Friend Who’s Sick,” from which this essay is adapted.